The DC apartment market is hot right now with new properties being built throughout the DMV. But not every building has the thoughtful touches and amenities that make a building feel like home. Many renters today have come to expect upscale finishes and in-unit appliances like microwaves, dishwashers, and even washer/dryers, but the most discerning clientele expect a level beyond — granite countertops, stainless steel appliances, and 24-hour concierge services are now the standard for high-end living. At Park Van Ness, we’re proud to offer our residents the creme-de-la-creme when it comes to luxury. For our extraordinary community members, we offer extraordinary features. Here is an overview of the onsite amenities we offer to ensure every need is met. Fitness Center – An onsite fitness center means you can ditch the pricey gym membership and get in a sweat session just steps from your own apartment. At Park Van Ness, we also offer onsite exercise classes and weekly rooftop yoga during the warmer months. Rooftop Amenities – Residents in many luxury apartment buildings enjoy the benefits of a property with a roof deck. 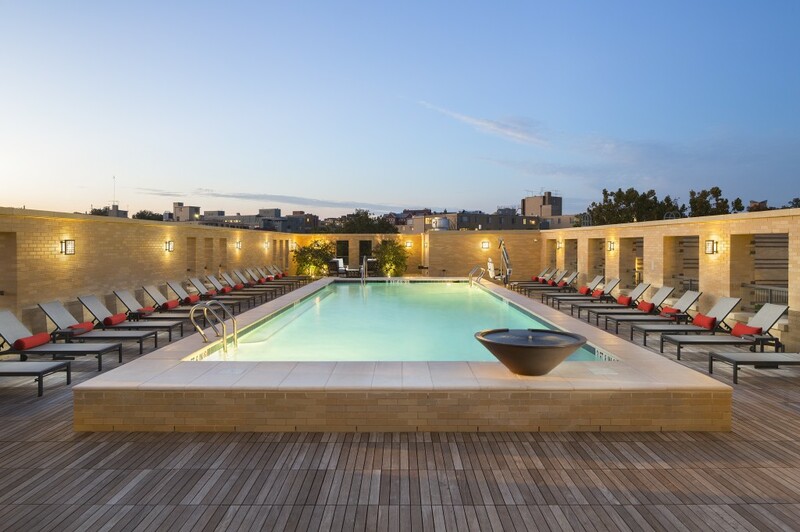 Not only does our rooftop allow for both park and city views, residents can also relax next to a pristine swimming pool, or grill outside at sundown. Year round, you’ll find our residents lounging on the roof deck overlooking Rock Creek Park enjoying these high-end offerings. Inviting Communal Space – In a city as fun and vibrant as DC, there are always new people to meet. Sometimes, even in your own building! Comfortable communal space with oversized couches and flat screen televisions makes it easy to get to know your neighbors. Park Van Ness offers plenty of areas inside and out for striking up conversation — or just getting work done beyond the confines of your own apartment. Additionally, we have a state-of-the-art chef’s demonstration kitchen that can act as a communal gathering spot for building-wide events or can be reserved for our residents’ private soirees. Off-Street Parking – Many Washingtonians choose to get around without a car, and living close to a metro line makes that especially easy. For those who do own a vehicle however, off-street garage parking is a coveted amenity– especially in the wintertime. Residents at Park Van Ness can go directly from their apartment down to the parking garage without stepping foot outside — a total lifesaver on a freezing, sleety day. Another perk, (and an eco-friendly one at that!) are the electric charging stations housed in the building’s garage. This is a big asset for residents and guests with electric vehicles. Connectivity – These days, we’ve all come to expect WiFi and easy charging everywhere we go. USB outlets can be found inside Park Van Ness apartments, usually in the kitchen islands or conveniently close by. Free wifi is offered in all of the common areas and everything is controlled by tablets in each common space. Residents experience total connectivity throughout the property. Pet Amenities – It’s not a requirement for all renters, but pet amenities such as dog runs and pet spas can be a fun benefit of a luxury building. At Park Van Ness, we host a pup pool party at the end of the season, which dog owners and their furry friends love! Additionally, every May, the building hosts a pet drive to benefit the Washington Humane Society during Pet Month and we’re always looking for ways to contribute to other local animal charities. Park Van Ness is an extremely pet friendly community and residents love the little perks that make their animals feel welcome. As a luxury apartment building in Washington, DC, we do our best to provide the best for our residents. If you’re interested in becoming a member of our community, contact us today for information about available units at Park Van Ness!